ARLINGTON, VA - May 7, 2018 - Hobsons is pleased to announce that three K-12 districts and six higher education institutions have been selected as finalists for the 2018 Hobsons Education Advances Awards. The Hobsons Education Advances Awards recognize the innovation that is possible when an institution combines people, process, and technology to make a difference in the lives of students. Hobsons is proud to recognize the accomplishments and celebrate in the successes of our clients, and is eager to share their best practices with the broader community. The finalists from each category were selected by an independent panel of judges, and represent leaders in the education space. Finalists for the K-12 College and Career Readiness category are: Metropolitan School District of Wayne Township, Indianapolis, Ind. ; Tempe Union High School District, Tempe, Ariz.; and Mount Diablo Unified School District, Contra Costa County, Calif. In the higher education Match & Fit/Admissions category, the finalists are: Bard College, Annandale-On-Hudson, N.Y.; SUNY Cortland, Cortland, N.Y.; and Western Connecticut State University, Danbury, Conn.
Finalists for the higher education Student Success and Advising category are: The College of Brockport (SUNY), Brockport, N.Y.; Syracuse University, Syracuse, N.Y.; and University of Massachusetts - Lowell, Lowell, Mass. The award-winning institutions in each category will receive a donation of $2,500 to use in continuing their efforts in helping students succeed. Two finalists from each category will receive a donation of $1,000 each. Winners will be announced in July at Hobsons Summer Institute 2018, in Palm Desert, CA. Metropolitan School District of Wayne Township, Indianapolis, Ind. - This public school district located in the metro area of Indianapolis, with around 70% of students who qualify for free or reduced lunch, implemented Naviance in the 2015-16 school year. 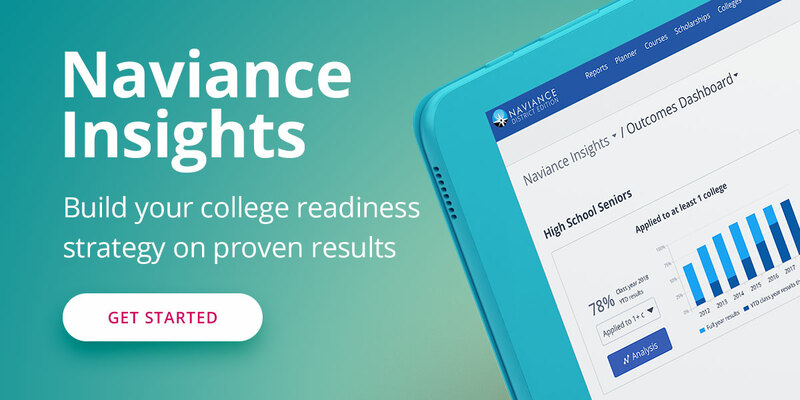 Since implementation, MSD of Wayne Township has introduced Naviance into the curriculum for grades 7-12, creating a thorough and comprehensive approach to integrating college and career readiness into the daily lives of students. Tempe Union High School District, Tempe, Ariz. - Tempe Union High School District is a public school district located just outside of Phoenix, Arizona. Within the last year, the district has implemented Naviance in order to provide easily accessible information to students and families at each of the seven schools. Since initiating Naviance, the district has increased communications with families, including first-generation and Spanish speaking families. The district hopes that by involving families in the process, more students will have the opportunity to go on to post-secondary educational institutions. Mount Diablo Unified School District, Contra Costa County, Calif. - Mount Diablo Unified School District is a public school district located in the northern region of California. With a district-wide enrollment of over 30,000 students, around 15,000 are on free and reduced lunches. For 20 years, the district did not have guidance counselors. The district initiated the use of Naviance in order to increase college and career readiness across the district. Since implementation, the number of students who complete a 4-year course plan has increased to 65% of all freshman, and is expected to rise as more high schools within the district increase Naviance usage. Bard College, Annandale-On-Hudson, N.Y. - With under 2,000 undergraduate students, Bard is a private 4-year college dedicated to diversifying its student body, while attracting students who will thrive and remain on campus. Partnering with Intersect, Bard has established a web presence through an enhanced College Profile and has begun implementing ActiveMatch to connect with students and deepen relationships through a specialized communications plan. Bard, who has also added more travel recruitment, both in the US and abroad, uses RepVisits to plan and schedule their high school visits. Early results from newly implemented admissions initiatives have shown a 5% increase in applications. SUNY Cortland, Cortland, N.Y. - Cortland is a mid-size public university in competition with every small private and SUNY institution in New York. Over the past three years they have worked closely with Hobsons and Intersect to identify and connect with best-fit students, in order to reach enrollment goals. In addition to ActiveMatch, they also recently implemented RepVisits to help the admissions recruiters build an outreach and travel plan to increase awareness with out-of-state applicants. As a result of these efforts, Cortland have seen an increase in enrollment by 200 students from states other than New York. Western Connecticut State University, Danbury, Conn. - Western Connecticut State University began its partnership with Intersect with the goal of increasing awareness of the WCSU brand outside of their primary recruitment territory (CT). Through the use of ActiveMatch, the University has been able to reach and connect with out-of-state students who are interested in similar universities. In only one year, WCSU has increased the out-of-state student population from 6% to 11% of the total population. The College of Brockport (SUNY), Brockport, N.Y. - Part of the State University of New York (SUNY) system, the College of Brockport supports around 9,000 students. In their mission to create a “one-stop shop” for academic and transitional student support, the college chose Starfish to provide integrated and holistic support for students, faculty and staff. Since implementing Starfish, the College of Brockport has seen a positive campus shift towards departmental collaboration on student success. Syracuse University, Syracuse, N.Y. - Syracuse University integrated the use of Starfish across all ten schools and colleges as part of the “Orange SUccess” program. Syracuse reports that the rate of course drops has fallen by 19%, the rate of earned failing grades has fallen by 7%, and course withdrawals has fallen by 8%. University of Massachusetts - Lowell, Lowell, Mass. - UMASS-Lowell is the second-largest campus in the University of Massachusetts system, with around 11,000 undergraduate students. Prior to implementing Starfish, faculty and advisors were tracking and flagging students in need of interventions manually. Since implementation of Starfish in 2012, UMASS-Lowell has increased retention rates for full-time first-year students from 79% to 86%. Register here for Hobsons Summer Institute 2018. A global leader in education technology, Hobsons helps students to identify their strengths, explore careers, create academic plans, match to best-fit educational opportunities, and reach their education and life goals. More than 13,000 K-12 and higher education institutions partner with Hobsons and leverage our solutions -- Naviance, Intersect, and Starfish -- to improve college and career readiness, holistic college admissions, and higher education student support for millions of students around the world.